Kim Abeles has a history of creating biographical artworks of strong females, including Calamity Jane, Rosa Parks, St. Bernadette, Eva Peron, Carmen Miranda, Beryl Markham, and more recently, Pope Joan. In her latest body of work, “Legends for a Reanimated Woman”, Abeles presents new works about Jeanne D’Arc (aka Joan of Arc), and selections of her earlier work. This fall, Abeles had the chance to travel throughout France to search for some of the sites important to the Joan of Arc story, walking twelve miles on a pilgrimage to her birth home in Domrémy. As is her practice with previous biographical work, she uses her photographs from her journey and researched materials to create an installation of 2 and 3-dimensional artwork in multiple materials. A specific aspect of the Joan of Arc story that captivated Abeles was that her image has been created hundreds of times in paintings, sculpture, and film, and all these well-known versions were created exclusively by men. She wanted to address the idea that her iconic images continued to be usurped as an image of the patriarchy and nationalism. There is, in contrast, a single sketch of Joan that was drawn on the margin of one of the court documents from her trial. It is a very simple, humble drawing, and makes an interesting contrast to the renderings of her created centuries later through the male gaze. Abeles’ interest in Jeanne d’Arc has to do with these representations, and she is also very much moved by her as a female character whose faith is unstoppable and profound. As a woman, she pushed beyond her expected roles in society, by virtue of her focused intention and a pure heart. That heart, in fact, did not burn in the flames of her pyre. Along with her ashes, her heart was thrown into the Seine River, in an attempt to eliminate a following of devotees. It is the complexity of her story that is so compelling, and it is that layering of meaning that gives Abeles the space to work out a multi-dimensional portrayal. An influential feminist interdisciplinary artist, Abeles received the 2013 Guggenheim Memorial Fellowship, and fellowships from J. Paul Getty Trust Fund for the Visual Arts, California Community Foundation, and Pollack-Krasner Foundation. She has exhibited in 22 countries, and her “Encyclopedia Persona A-Z” toured the U.S. and South America, sponsored by the United States Information Agency. She received her MFA from University of California, Irvine. Her work is in public collections including MOCA, LACMA, Berkeley Art Museum, and National Geospatial Intelligence Agency. 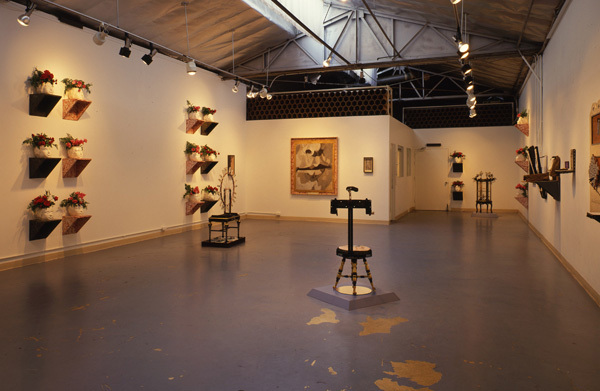 Abeles’ journals and process documents are archived at the Center for Art + Environment, Nevada Museum of Art.